Prominent & Leading Manufacturer from Thane, we offer double expansion type tube sheets. Double Expansion Type Tube Sheets provided by us are structured using top quality products and are made keeping in mind the contemporary needs of various industries. Being a tube sheets manufacturers, we have always looked for clients satisfaction. 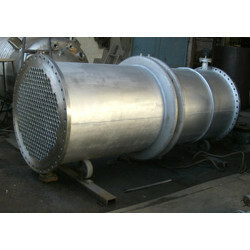 These are heat exchanger tube sheets which are used for high pressure applications. Looking for Double Expansion Type Tube Sheets ?